Comp & Save allows comparison between 2 products of different sizes, units and price and lets you know which is the better value of the two. 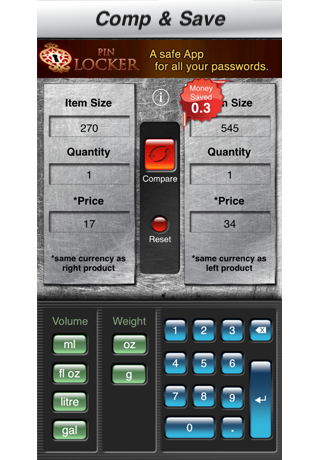 Simply input the item size (Metric or Imperial units), quantity and price of the products you would like to compare, results will be instant and show you which is the better value of the two. You can also compare single item with different sizes and volume packaging and don’t have to worry about paying more for the same product. Comparison based on item size, quantity and price. Item sizes support on ml, fl oz, litre, gal, oz and g.
Compare between two products to see which one has the best value.